No, they are not sculptures! We have some weird looking structures on our campus these days. Whereas our carpenter, Harry Carter, may consider them works of art, that is not their real purpose. 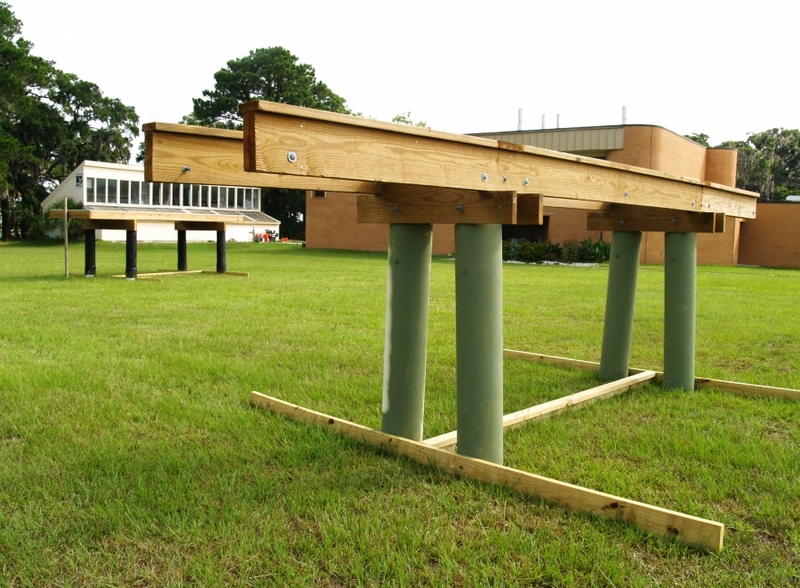 These “mock docks” are part of a research project by one of our scientists, Clark Alexander. 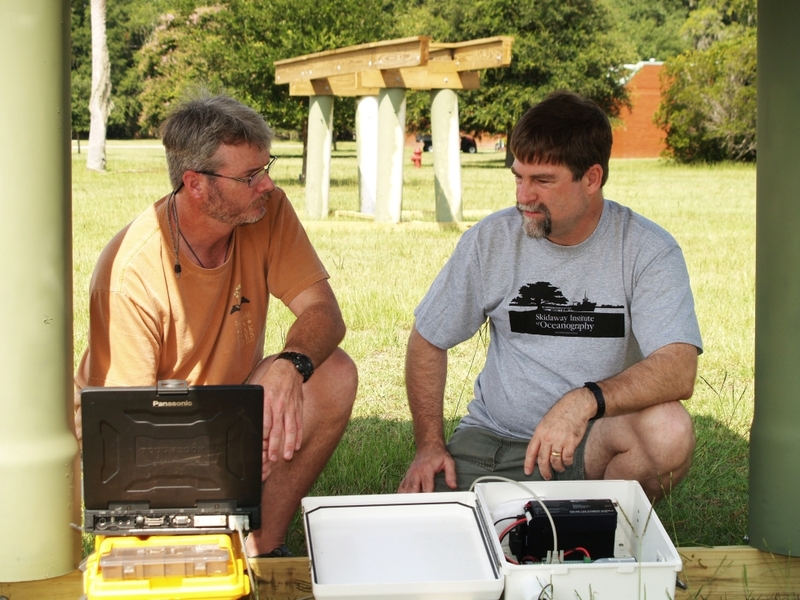 Clark Alexander (right) and research tech Mike Robinson work with light sensors beneath one mock dock. He is trying to determine what effect some new dock designs and materials have on the salt marsh they cross. The issue all goes back to earlier research by Clark and other scientists that has shown the shadow cast by docks has a detrimental effect on the salt marsh vegetation underneath and nearby. In recent years, the various regulatory agencies have been stricter about issuing new dock permits, especially for private docks. 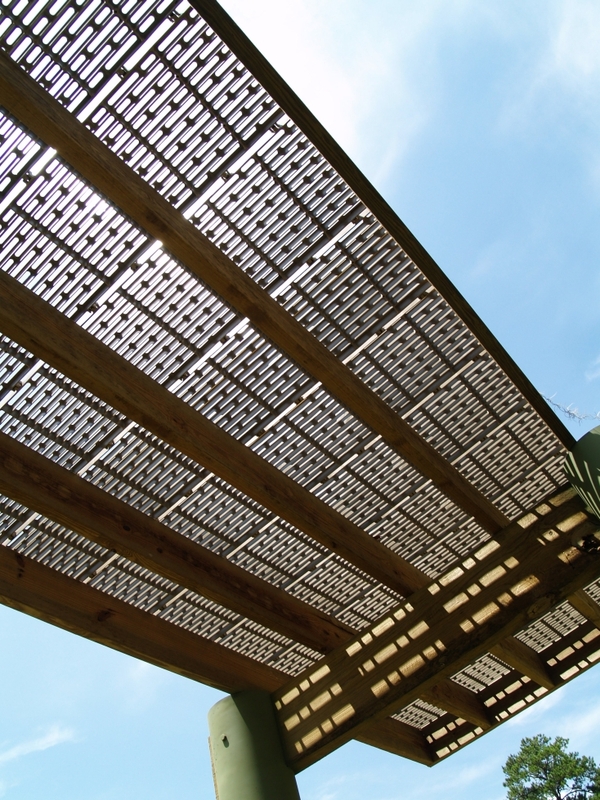 In reaction to that, some dock manufacturers have come up with some alternate designs and alternate materials to mitigate the docks’ impact. The goal is to create a dock structure with either a smaller shadow footprint or a lighter shadow. One new design, the Dockrider (above), does not have a walking platform. Instead of the traditional platform of 1×6″ planks, the dock is an open framework. To get from the high ground to the terminal platform, an electic cart is used. It rides back and forth on the open frame. 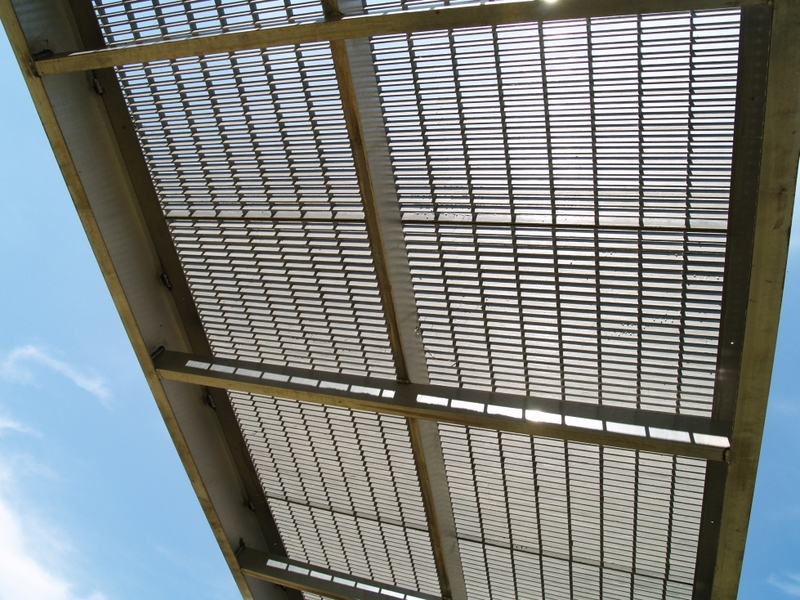 Two other manufacturers are using a metal or plastic grate for the platform. This allows some light to pass through. The question now is, “Do they actually work as advertised?” With the cooperation of the dock suppliers, Clark has had our shop crew build these dock replicas and place them in an open, unshaded field on our campus. Clark plans to keep these mock docks in place for the next two years, moving them around the points of the compass throughout the seasons, periodically measuring the light beneath and to the sides nearby. He’ll them raise and lower them to get data on how the height of the docks affect the shadow. We’ll let you know how things develop.